Let’s explore where this may happen for you. Great workers often have elements of OCD in the area where they excel. This is Obsessive Compulsive Discipline, rather than Disorder. They know how to control this characteristic, however, rather than let it control them. People like to feel in control. They like a sense of order and predictability. So this means they can get obsessive about little things. They may have specific routines they follow for creating order in their daily lives. People sometimes have other obsessions. They may be obsessed by designing gardens, solving maths problems, developing green energy, finding medical cures, renovating houses, helping people to take charge of their lives or whatever. Sometimes they translate these drives into pursuing specific projects. When has this happened for you? If you wish, try tackling the exercise on this theme. This invites you to do the following things. 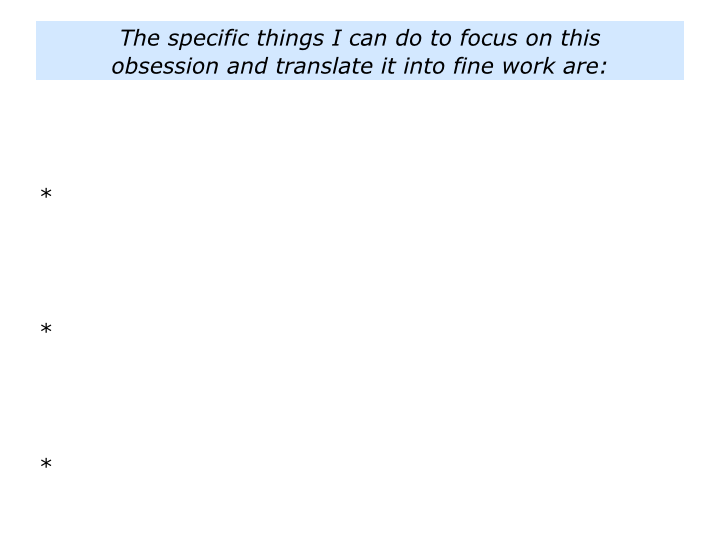 Describe a specific time when you focused on one of your obsessions and translated it into doing fine work. Describe the specific things you did to translate it into fine work. Great workers sometimes follow their obsession and put in the legendary 10,000 hours of purposeful practice. They focus on practice that enables them to improve, however, rather than just making bad habits permanent. Such people also develop what Arie de Geus called a Memory of The Future. 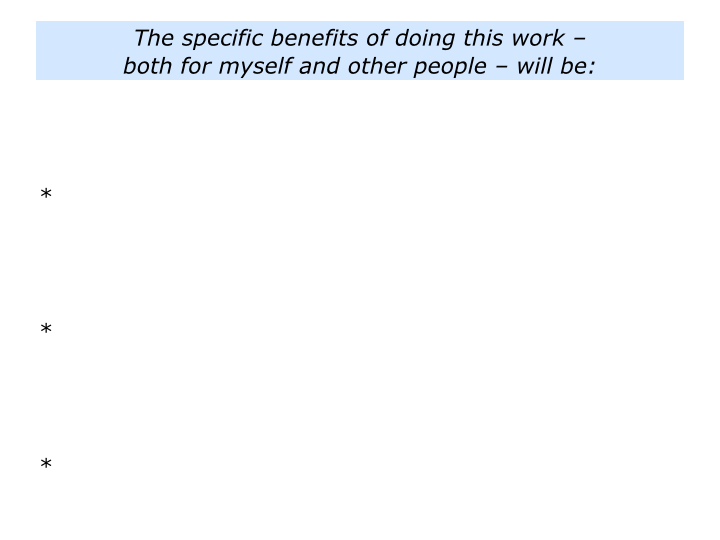 Arie has spent much of his life helping individuals and organisations to do scenario planning. You can discover more about work in The Living Company: Habits for Survival in a Turbulent Business Environment. Arie found that high performers often demonstrate certain characteristics. They have a strong feeling for the activity and are able to quickly see patterns. They are fascinated by the activity and constantly envisage possible scenarios. They frequently rehearse the possible strategies they would pursue in such scenarios and explore how they would achieve success. People who do these things build up a repertoire of choices for tackling challenges. So, when a particular challenge arrives, they appear to be ahead of the game. Let’s return to the things that you find fascinating. 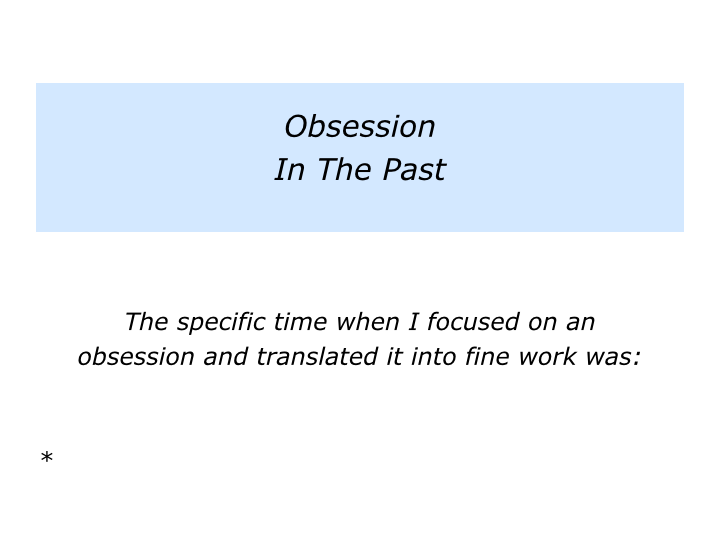 Are there any obsessions that you want to pursue more in the future? Which of these would you like to translate into a specific project? You may want to renovate a house, cultivate a garden, raise money for charity, share knowledge about an illness, publicise the positive things that people are doing across the world or whatever. 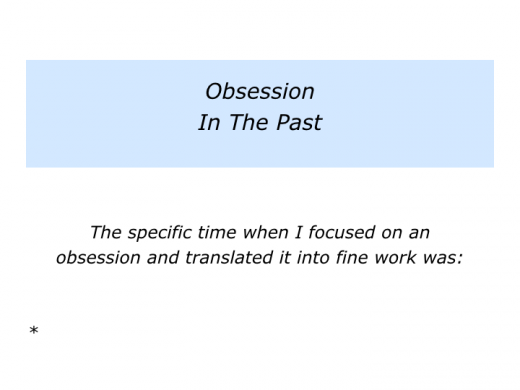 Describe an obsession that you would like to focus on and translate into fine work. 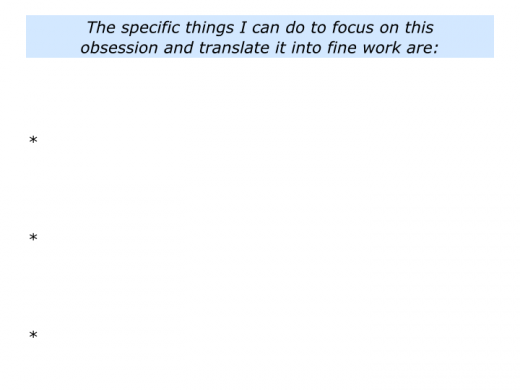 Describe the specific things you can do to translate it into fine work. 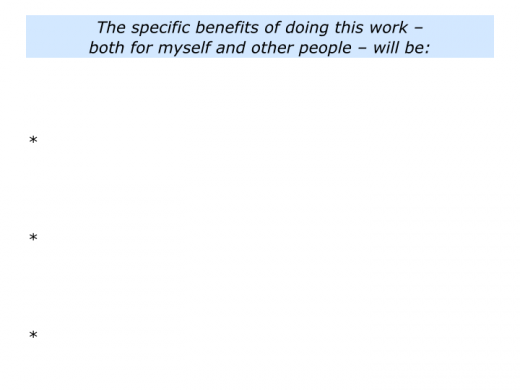 Describe the specific benefits of doing this fine work – both for yourself and other people.